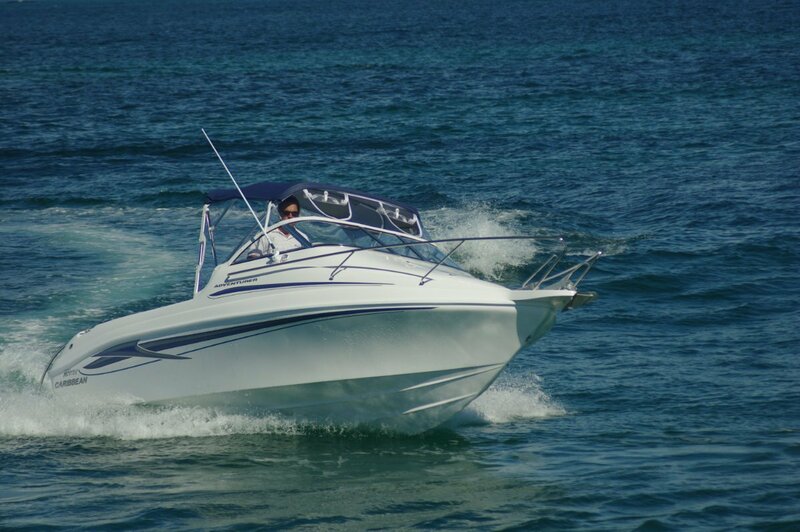 Caribbean is one of Australia’s oldest established fibreglass boat builders, producing boats that command well above average resale prices. Part of the reason for that is a deserved reputation for quality, part for generally having owners who loved and looked after their boats, and certainly part for designs that do not follow transient fashions. The 6.2 metre Caribbean Adventurer was not created primarily as a fishing boat; the aim was for an adaptable family boat. But its form is more than reminiscent of a scaled down Reef Runner – still many people’s ideal of an offshore fishing boat – and fishing usually features largely in its career. For cruisy days five, perhaps six people can sit in considerable comfort in the cockpit; the two principal seats especially, pedestal swivels on small cave lockers, are luxurious and the kind of thing you want on a long passage. The rear lounge, being rear, is still way beyond average in ride quality. It essentially disappears when fishing or rolling out of swags takes priority. With a subtle hand movement the cushion drops down flush with the back to create a fishing pozzy for a millionaire’s thighs. Other angler’s delights? There are rod holders, and the side pockets are long enough to take rods horizontally. A locker, underdeck amidships, is a wet or dry proposition capable of the ice slurry role. The cockpit grab rails are recessed into the coamings, and at the transom is a pair of large capacity bait tanks. Any or all of the latter, of course, can be pressed into the ice box task on party days. The side pockets extend from end to end, for half their length carpet lined to suppress rattles. 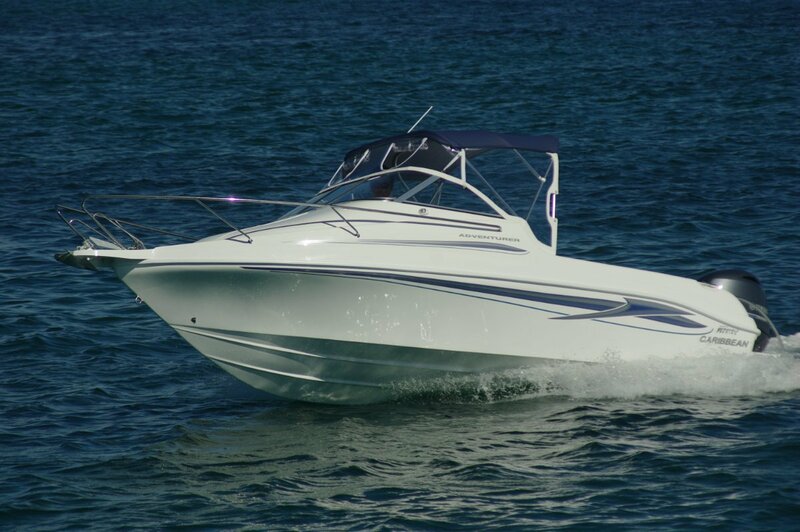 Unlike many fibreglass boats, Caribbeans have fibreglass sides to the pockets rather than vinyl. These pockets can be safely used as steps just like an aluminium boat. That attention to important detail is typical of the thought given to construction and equipping. 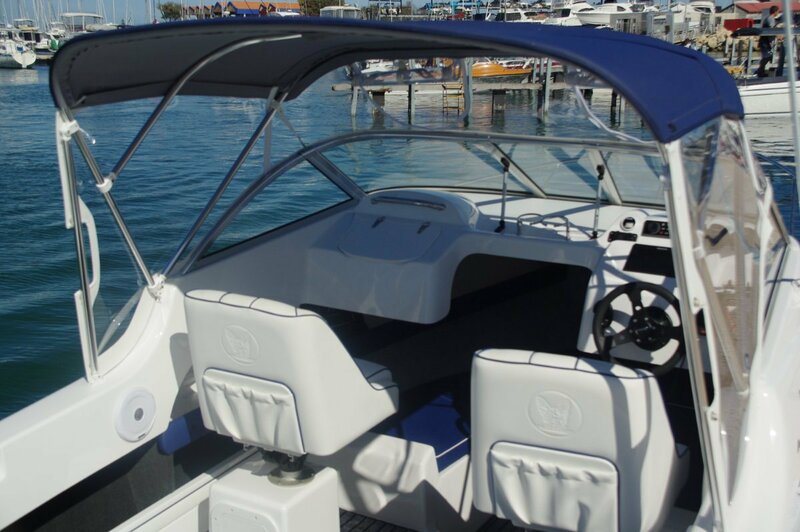 Further instances include the all-important dual battery installation; stainless rod holders instead of plastic; hydraulic steering; premium materials in the Bimini and its structure – this could still be delivering shade in a decade or more’s time. The Adventurer has a sharp 19 degree deadrise which without cunning hull design could make for a twitchy boat at rest. Part of the design was a narrowish beam that makes the chines a little more eager to embed themselves when the boat stops moving. Mainly though it is the subtlety in the shape that allowed a pair of middleweights to lean over the rail and cause barely a handful of degrees heel. Under way behaviour was reminiscent of the bigger sister. 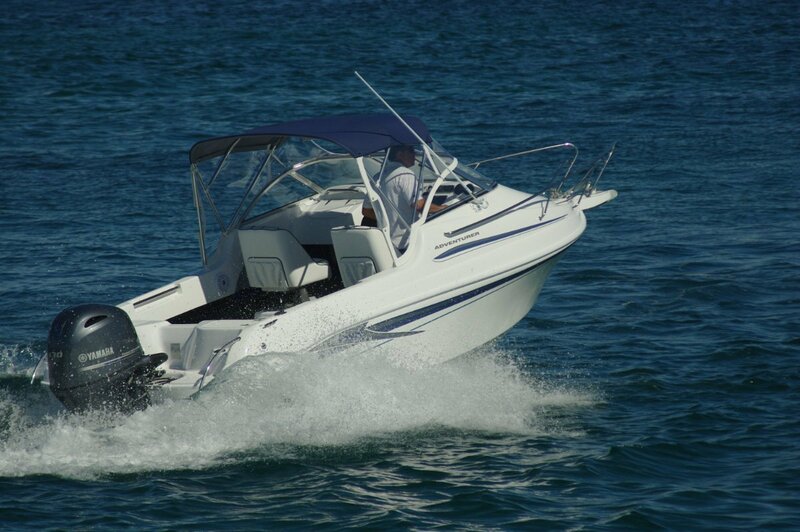 A ride no one could complain of; ready response to the trim button and yet not sensitive to weight moving around in the boat; and a delight to manoeuvre – helped, as it always is by hydraulic steering. Although rated for higher power, the 130hp Yamaha was a good deal more than adequate and gave quick response to throttle. The positioning of controls, and driving seat height helped make the driving task effortless, though the standing driving position works well too. This is a fun as well as purposeful boat. The fore cabin is minus a bulkhead, helping the overall feeling of spaciousness. Realistically, the bunks are child sized – though even more realistically they are unlikely to be often used for sleeping, as is true of nearly all trailer boats. The cabin is a good refuge for kids losing interest in fishing, has excellent storage under those bunks, and the enormous fore hatch gets a good flow through of air at anchor. The hatch is also the only practicable access to the anchor, so size helps here. Possibly with the entertainment of those children in mind, agents Mansfield Marine installed a top of the line stereo system. Swimming is one activity the small fry will definitely want to be in, and a pair of boarding platforms flanking the motor gives them access. With the rear seat folded the cockpit provides plenty of changing room for swimmers or gearing up for divers. Definitely an all rounder.